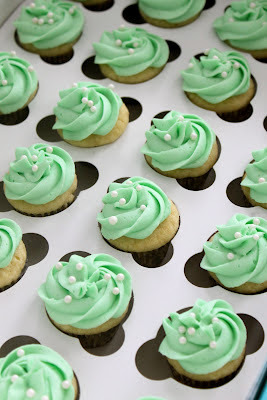 In honor of the Kentucky Derby this upcoming weekend, I decided to share with you my recipe for mint julep cupcakes. To tell you the truth, I have never been to the Kentucky Derby nor have I tried a Mint Julep. I am not going to lie, I am allured by the sun dresses and large hats, but could honestly do without a horse race. I suppose for now I will stick to baking. I made these cupcakes in miniature version for a friends bridal shower last summer and have been saving them just for this occasion. The mint and bourbon are very delicate and add just a little something special to these cupcakes. I was surprised by how much I enjoyed them and I think you will too. I think they would be great garnished with a mint leave and a drinking straw. The recipe below is for the full sized version. In a medium bowl combine the flour, baking soda, baking powder, and salt. In a separate mixing bowl, cream the butter and sugar. Beat in the eggs, one at a time. Add the bourbon, vanilla and mint; mix well. Add the flour mixture to creamed mixture alternately with sour cream (batter will be thick). Fill greased or paper-lined muffin cups with 1/4 cup of batter. Bake for 25-30 minutes or until a toothpick inserted near the center comes out clean. Beat butter, bourbon, mint, and salt until smooth. Add powdered sugar 1 cup at a time, beating until combined. Add milk 1 tablespoon at a time until you reach desired consistency. 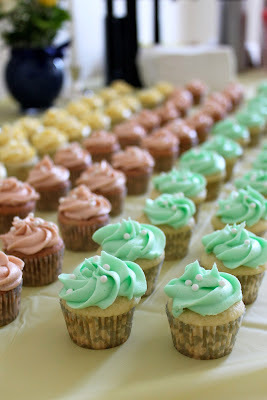 Add drops of green food coloring until you reach desired color.